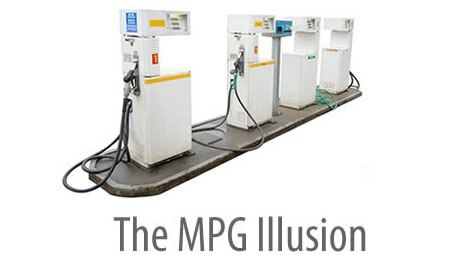 MPG obscures the value of small MPG improvements on inefficient vehicles. The improvement saves 8 gallons per 100 miles of driving. Compare that gas savings to the amount saved under currently planned CAFE improvements. Between now and 2016, CAFE standards will be increased from 25 MPG to 36 MPG. This 11 MPG improvement saves a little over 1 gallon per 100 miles of driving. Policy should focus on improving the most inefficient vehicles because that's where the big savings are ripe for the plucking. For 50 years, long haul tractor-trailer designs have remained fundamentally unchanged. Basically a giant box hurtling down the highway at 55 miles per hour, most trucks average only six miles to the gallon. Their ubiquity in America is undeniable. Today the trucking industry transports about 70 percent of all the goods in the county, moving nearly $24 billion in value in 2008, according to the U.S. Department of Transportation. But the time is ripe for change. According to recent analysis by Rocky Mountain Institute the technology already exists to double the energy efficiency of long-haul trucks in the nation's fleet. Their size, speed and poor aerodynamics mean they are laden with "low-hanging fruit" in terms of cost-effective efficiency and retroﬁtting opportunities.